Few things are as driven by maximalism as architecture. The craft stands out for its almost boundless urge to prove itself. Success depends on the fullness of the portfolio, on the size of the projects, on prestigious clients, on a deluge of publicity, and, last but not least, on a certain type of personalities for whom enough is never enough. Unbridled ambition is the hallmark of the famous architecture firms and schools, where “going home” is considered tantamount to giving up. For anyone hoping to escape the drudgery of just meeting the client’s programmatic demands, sleeping under the desk is perfectly normal. If you want to become a thinking, creative architect, not only must you be capable of doing anything, you also have to do it. Work, work, work: that’s the motto. But architecture is maximalist not only in this quantitative sense. It also has a penchant for maximalist designs – not lots, but huge. Many projects that were realized in the heyday of the architectural icon, seem confrontational rather than adaptive, filling airtime and screaming for attention. Often, it seems these projects revolve around filling a traumatic absence, both physically and morally. As if the void is an unbearable evil. But a counter movement has emerged. The movement of doing less, sometimes even doing almost nothing. Projects have come into existence which aim at the exact opposite. They are small, subtle suggestions that do not aim so much to negate the emptiness as to mark it. This is not an architecture of the complete makeover and grand strategies, of retouching reality rather than adding a subtle touch. This is about an architecture that discovers that tactics are often the better option, that doing things is a question of degrees, of the right dose. 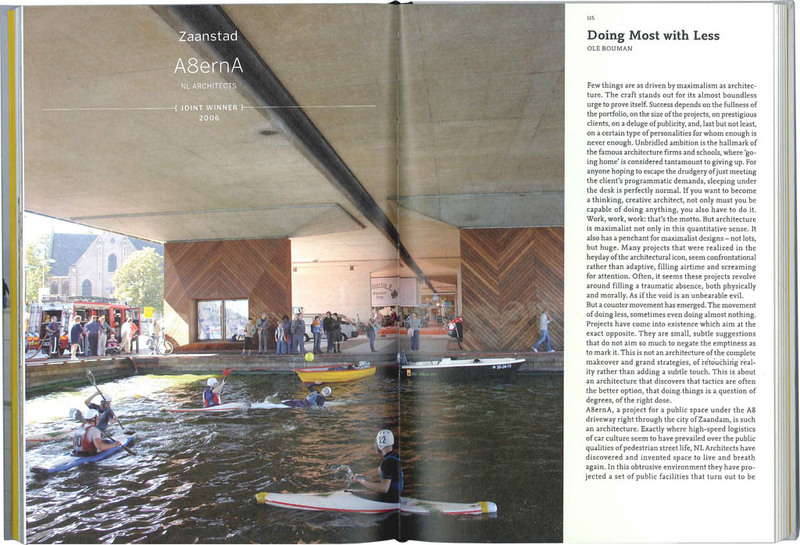 A8ernA, a project for a public space under the A8 driveway right through the city of Zaandam, is such an architecture. Exactly where high-speed logistics of car culture seems to have prevailed over the public qualities of pedestrian street life, NL Architects have discovered and invented space to live and breath again. In this obtrusive environment they have projected a set of public facilities that turn out to be stronger and more attractive than the archetype of dehumanized wasteland: the neglected spaces under the notorious highway flyover. And so they made an environment for shopping, meeting, playing, relaxing, strolling andd skating, on top of a continued deck that connects all facilities in one single gesture. They acknowledged the brief in their own creative way, redefining the aims, suggesting the hidden potentials of the site. Much better than maximal design this project can be called generous design. It doesn’t direct its use, it catalyses it. It encourages people to occupy and appropriate, a much more subjective version of using “facilities”. So modest is the intervention that the clients even seem to have forgotten that they needed architects to do it or them, that they couldn’t do without architectural intelligence. On the official webpage that belongs to the area (http://www.zaanstad.nl/sv/a8ernahp/?view=Standard) , they don’t mention NL Architects at all. Perhaps that’s the strongest feature of this architecture of almost noting. The design of public space becomes so transparent, natural and logical, that is seems to have emerged out of the ashes of derelict terrain as a gift of fate, not the product of hard work by a very intelligent office. Intelligent they are. They saw the opportunities in oblivion. They saw strength in decay. They saw joy in negative space. The most important quality of this design is to identify quality itself, where nobody expects it to be found. You need a supple mind, first of all; and then enthusiasm, bravura and determination to make it work. Perhaps it is the European spirit that has inspired NL Architects. This mind shift becomes strongest, when it is directed to the transformations of public space. Against all odds, the European city keeps resurrecting as the urban DNA of the continent. Cost of the miracle this time: 2.7 million. 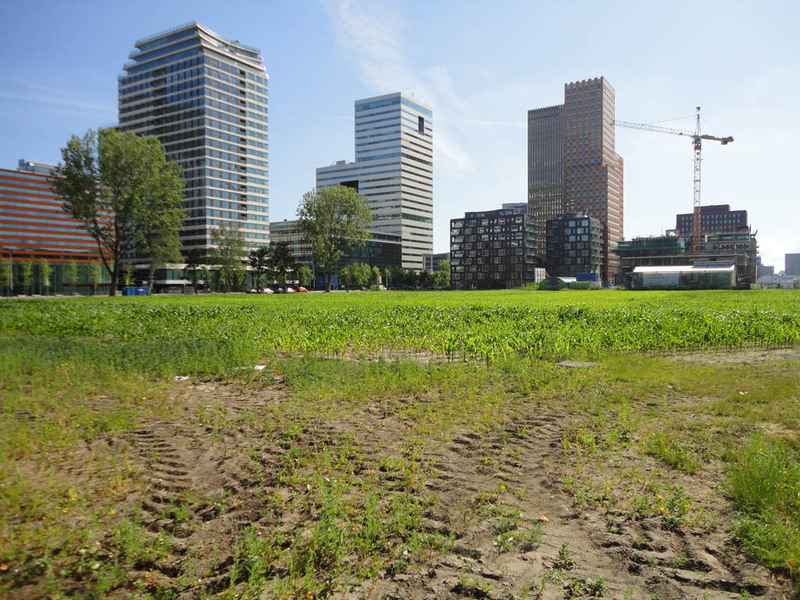 On the most expensive ground in the country an unexpected crop popped up: a vacant lot on the Zuidas turned into a cornfield. Making the most out of the crisis: Developer turning Farmer.